When Anna was married, she and her husband Lewellyn had a daughter, Amber. Anna knew from the beginning that she wanted a Catholic education for Amber. Having grown up in Mosinee, Anna made the decision to enroll Amber at St. Paul School: “I wanted her to have the [faith] base because things are changing so, and more and more as decades go.” With a child herself, Anna began to understand the importance her father placed on Catholic education, but she knew that, especially now, girls too needed the moral guidance and mentoring the Catholic schools provided. This decision to send her daughter to St. Paul started a decades-long relationship Anna has had as a supporter of the small school in central Wisconsin. She calls it ironic that she didn’t start her own faith journey with a Catholic education, since she now counts it a big part of her life. This spirit and enthusiasm are what keeps Anna involved in the St. Paul School community. After enrolling Amber and seeing the positive impact it had, she unhesitatingly enrolled her adopted son Paul. When Anna and her husband brought 8-year-old Paul back from Poland to his new home in central Wisconsin, she enrolled Paul in summer Bible school at St. Paul Parish to “get him acclimated to the school, and to the children, and to English.” The following school year, he began attending St. Paul School. She knew the family atmosphere and small class sizes would be ideal for Paul transitioning to a whole new language and culture. “He did, and still does, remarkably well,” she says. 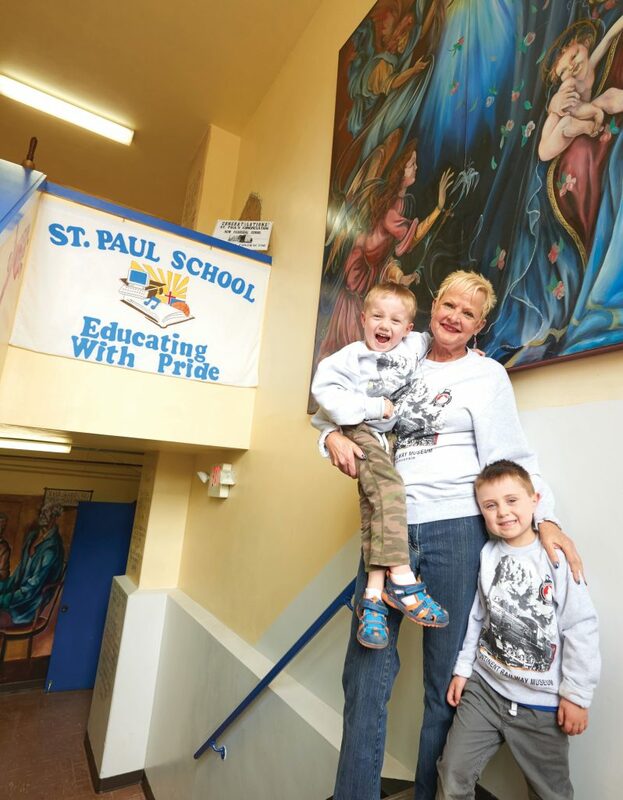 Anna continues to support her parish school, especially now that her grandsons are the next generation to attend St. Paul School. As her children have grown, Anna continues to see the fruits of their St. Paul education, demonstrating those fostered gifts and talents, as well as finding footing in the solid foundation instilled all those years ago. Anna is a registered nurse who owns and operates St. Rita’s, a small residential facility for adults with disabilities. She has the joy of working side by side on a daily basis with Amber, who became a respiratory therapist. And now Amber’s two sons, Jerry and Edward, attend the St. Paul preschool program. For Anna and many other families who choose St. Paul School for their children, they do so because they are immersed in a family-first atmosphere, “which extends from the principal meeting the busses each morning to parents and grandparents coming to the office throughout the day,” Havican shares. “Because we are small in number,” Father Przybylski explains, “the older students … watch out for the younger students and set a positive role model for them.” It very much reflects a family .Not only is the family atmosphere palpable in the school, it radiates out to the community. Anna’s residential home has afforded her the opportunity to connect St. Paul students with her residents on a regular basis, celebrating holidays together with activities such as caroling at Christmas time. The collaboration is mutually beneficial — bringing joy to Anna’s residents and teaching the students compassion and empathy. What news at St. Paul School?